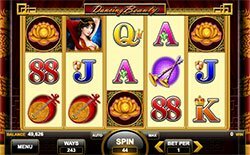 Take in the sights of traditional Asian entertainment in Dancing Beauty online slot from Spin Games. This beautiful game is set on a 5x3 reel grid and offers 243 ways to win on every spin. Earn additional wins when you string together wild symbols on reels 2 and 4 with normal symbols. The free spins bonus is even more rewarding with sticky wilds and a 2x multiplier added to wins. Join the Dancing Beauty in a winning journey today! Take in the sights of traditional Asian entertainment in Dancing Beauty online slot from Spin Games. This beautiful game is set on a 5×3 reel grid and offers 243 ways to win on every spin. Earn additional wins when you string together wild symbols on reels 2 and 4 with normal symbols. The free spins bonus is even more rewarding with sticky wilds and a 2x multiplier added to wins. Join the Dancing Beauty in a winning journey today! Wild Symbol – The beauty lady is the game’s wild symbol and appears on reels 2 and 4 only. It will substitute for all symbols except the golden lotus scatter and Wheel Power bonus symbols. During normal mode, one wild substitution in an individual winning combination multiplies the individual award amount by 2x and two wilds will multiply it by 4x. Free Spins Bonus – Land three or more golden lotus symbols scattered anywhere the reels to win 8 free spins. All wins are multiplied by a 2x multiplier in this round. Extra wilds are added to the reels in this round and any wilds that hit will remain in place for the duration of the free spins round. Wheel Power Game – Land two Wheel Power symbols on reels 1 and 5 to trigger the Wheel Power bonus. The Wheel Power is a double layered wheel that awards credit prizes and a possible re-spin. Earn up to 25x your but plus up to 4 re-spins!